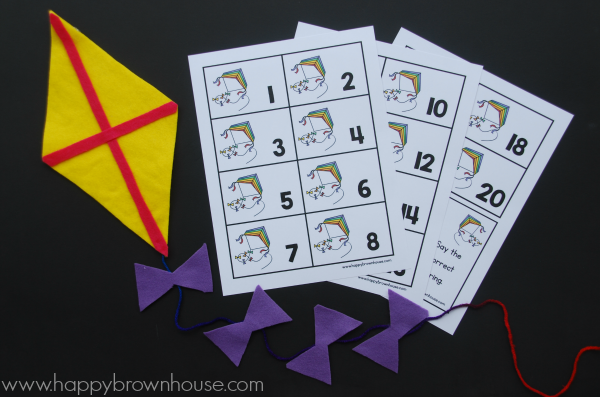 This Kite Counting Math Busy Bag for preschoolers and kindergartners is a fun way to practice counting, identifying numbers, and one-to-one correspondence. 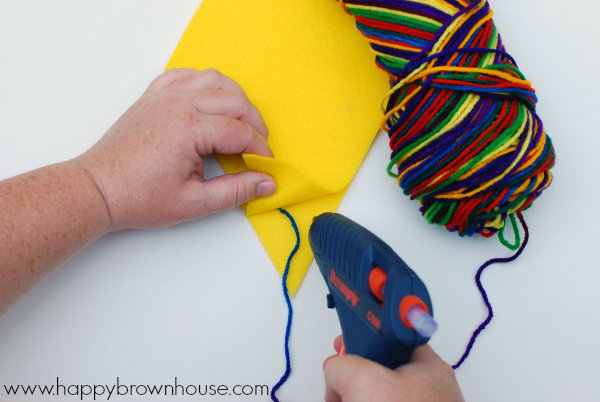 This busy bag idea is easy to put together with a little felt and hot glue. Plus, I’ve included a printable at the bottom of this post to get you and your little one started and on your way to counting fun. Counting and one-to-one correspondence are so very important in the early years. Rote counting involves memorizing the number words in the proper order (one, two, three, four, five…). Often, this becomes like a song with no meaning behind them. Young children are also capable of recognizing numbers from one to ten. They can learn the number names as well as recognizing the number symbols. One-to-one correspondence is being able to use this knowledge to skillfully count an actual number of objects. A child that understands one-to-one correspondence knows that 2 cookies = the number 2 or that 5 raisins = the number 5. Many young children have memorized the number words in the proper order, but sometimes they do not yet understand the concept of one-to-one correspondence. For example, they might say “1,2,3,4,5″ but skip an object. Or, they count an object twice. Children need many opportunities to practice saying one number with one object. For practicing this, I suggest touch-counting. Children should actually touch the object as they are saying the numbers. 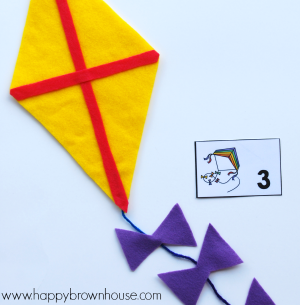 Children’s counting skills will soar with this fun kite activity. Children will identify numbers and place the correct number of bows on the kite string. As children count the bows, they are working on one-to-one correspondence. 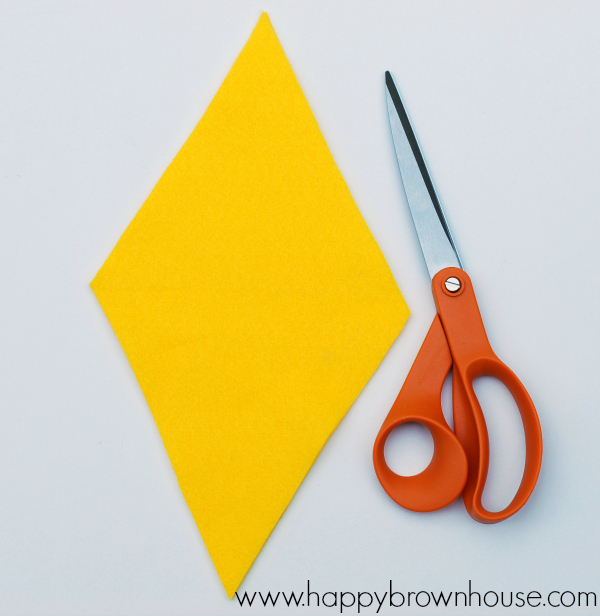 Cut two identical large diamond shapes out of one color of the felt. This will be the kite. Hot glue the two diamond pieces together, leaving a small section at the bottom open for the yarn. Place 2 inches of the yarn in the opening and hot glue the rest of the way around the kite. Cut the yarn 50 inches long. 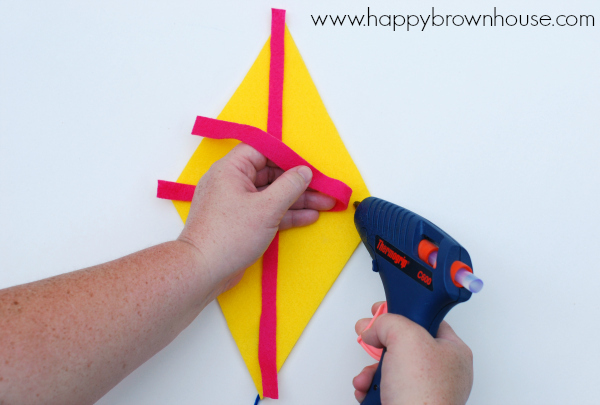 Using another color of felt, cut strips of felt to make the cross lines on the kite. Hot glue the strips of felt in a cross pattern on top of the kite. Trim any excess felt away from the strips. 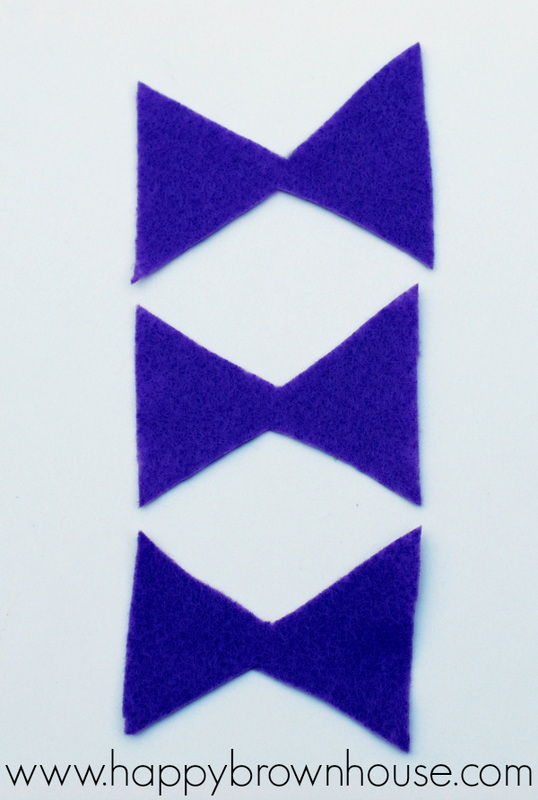 Cut 20 bow shapes out of the last color of felt. I just made them look like an hourglass shape. 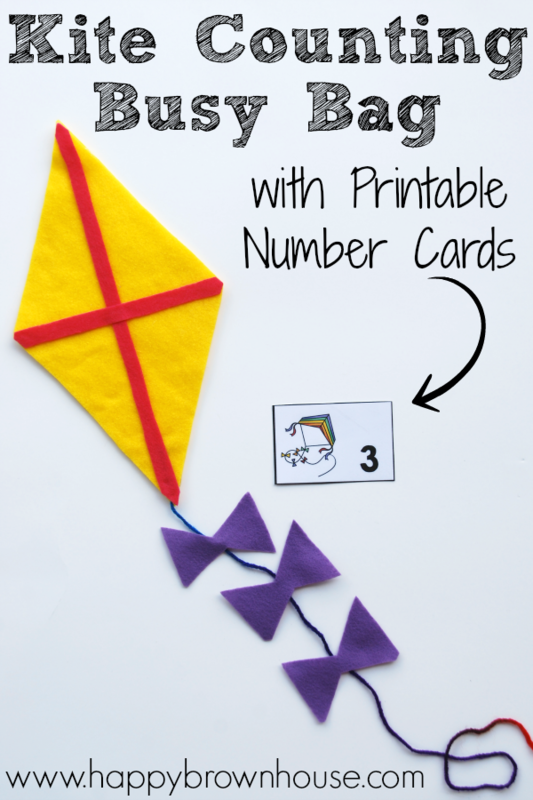 Print the Kite Bow Counting Number Cards. Laminate the Kite Bow Counting Cards for durability. Cut the Kite Bow Counting Cards apart. Children will pick a number card, say the number, and then place the correct number of bows on the string. Once they have completed that number, they will repeat with a new number card. Want a different way to play? Play Race to 20: Each person rolls a die, then counts out the number of bows and adds them to their string. Each player takes turns. The first one to 20 kite bows is the winner. Play Count Down from 20: Each person places 20 bows on their kite string. They roll the die, then remove that number of bows from their kite string. The first person to remove all of the bows is the winner. Click here to purchase the Kite Bow Counting Number Cards in my shop. 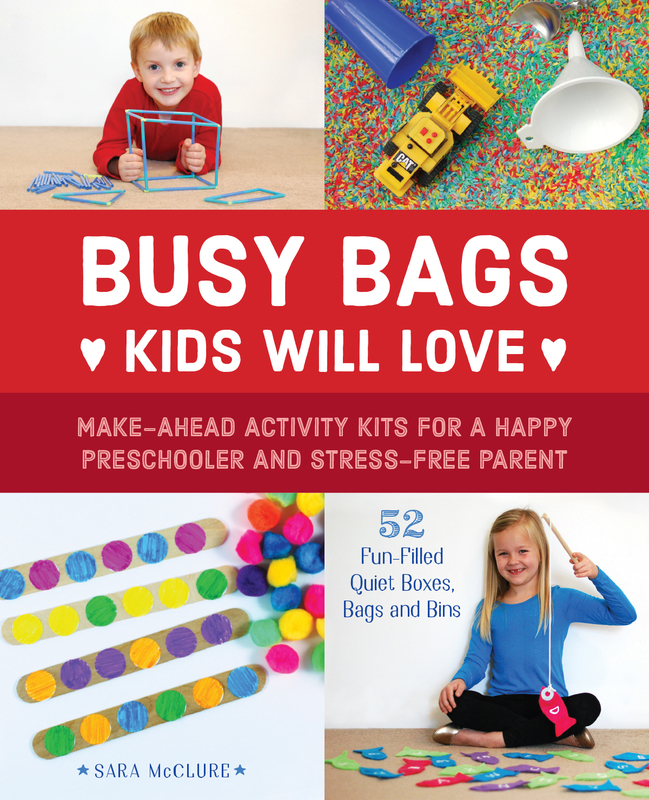 Want even more busy bags? Check out my book, Busy Bags Kids Will Love!